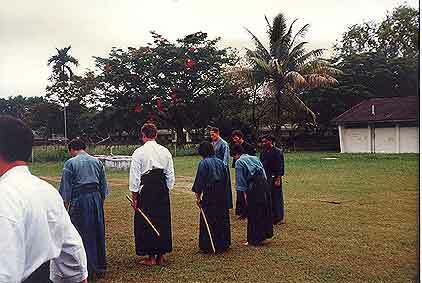 Morning training in Taiping, Malaysia, at the first international Jamboree in 1979. Standing on the Joseki side are Donn F. Draeger Sensei, Pascal Krieger and Karunakaran. Pascal Krieger returns from a stay of more than 6 years in Japan in August 1976. Soon after his return, the Shung Dô Kwan in Geneva asks him to teach Jô and Iai. His first students are those left since his first return to Switzerland in 1971 (January) when he introduced Jô and Iai in Switzerland, teaching these two disciplines unofficially at the time. The group gets bigger, in 1977, with some students from Montreux (Krieger's birthplace). In 1979, Pascal Krieger founds the AHJ (Helvetic Jôdô Association). The same year, he takes with him the majority of his students to Malaysia for the 1st International Jôdô Jamboree of the IJF (International Jôdô Federation) under the direction of Donn F. Draeger Sensei. In 1980, with France, Netherlands and Sweden, Pascal Krieger organizes the venue of Tenshin Shôden Katori Shintô Ryû, with Otake Risuke Sensei and some of his students, as well as Shindô Musô Ryû with Kaminoda Tsunemori Sensei and Donn F. Draeger Sensei. This European tour of two of the most respected Japanese martial traditions (Ryû) gives a new start for the development of Jôdô, not only in Switzerland but in the whole of western Europe. 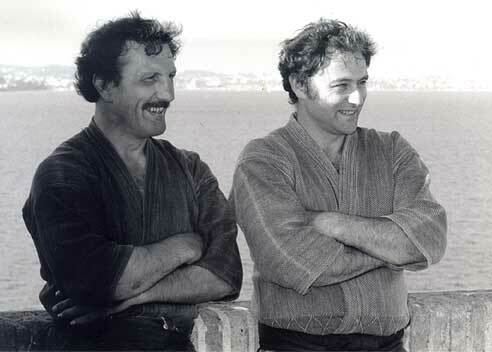 Tiki Shewan Sensei ( right) and Pascal Krieger at the training camp in Lérins Island (Cannes) in the early 1990s. A long and enriching friendship. 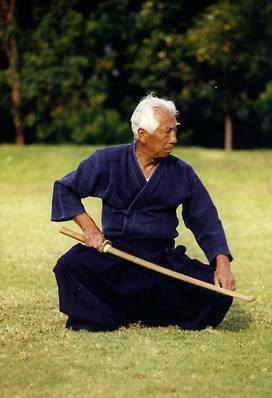 In 1978, Malcolm Tiki Shewan Sensei approaches Pascal Krieger to know more about Jôdô, discipline he practised for the first time in 1976 with Mitsuzuka Sensei. It is the start of a very enriching exchange: Shewan Sensei, Aikidô teacher, at the time already a convincing expert in Iai and Ken, helps Pascal Krieger to fill up the gaps existing in his Iai practice while completing his Jôdô study with him. From that time, Shewan Sensei, along with his closest Iai students (Floréal Perez, Dominique Pierre, Raff Raji, Daniel Leclerc, etc.) gets more seriously into Jôdô and includes this discipline in most of the seminars given around Europe. Thanks to this, the Swiss group and the AHJ (Association helvétique de Jodo) becomes much more widely known and the demand for Jôdô seminars grows drastically. After the 2nd International Jôdô Jamboree in Malaysia (Taiping 1982), the very year Draeger Sensei passed away, the necessity for the creation of a European Jôdô Federation becomes obvious. Pascal Krieger starts building up this Federation as from 1983 and continues to consolidate the structures of his Jôdô group, now European. However, the official statutes of the EJF are registered on 13 January 1990, in Geneva, Switzerland, according to Article 60 of the Swiss Civil Code. In 1994, at the International Seminar of Hawaii, USA, the participation of Nishioka Tsuneo Sensei brings a new dimension to the technical side. His style, more classical, in which the role of the sword refinds its lost meaning, is enthusiastically adopted by the EJF Technical Board and, in the following three years, by the majority of the European practitionners. Since 1994, Nishioka Sensei continues to help the EJF on the technical side, and this is very appreciated.